4-2-20. Sterling silver, hard fired enamel lettering. Hallmarked California. Norris Stamping Police Matron #3 badge, circa 1945. During WWII they made various ammunitions for the defense department. Now known as Norris Industries they make steel and brass cartridge cases, LAW rocket launchers, missle and bomb casings, mortars, projectiles and grenade bodies. Made of sterling silver and set with a diamond below the number. Matron National City Police Calif. National City is the 2nd oldest city in San Diego county and was incorporated in 1887. 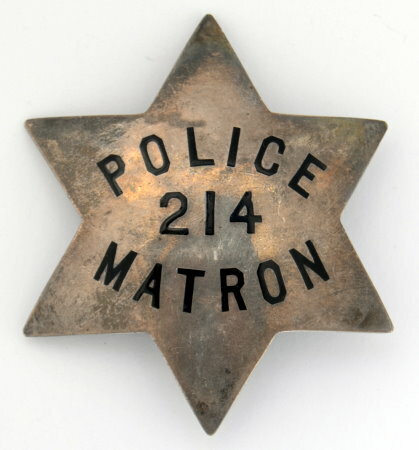 Matron South San Francisco, badge #1, Sterling silver, hard fired enamel lettering. Hallmarked I&J.